Klein is an excellent brand, and they offer different types of budget multimeters. You will find all Klein digital multimeter list here. One of the models from Klein that I have come to fall in love with is the Klein mm600 multimeter. This is a well-constructed meter with lots of features. It is made of a rugged body that can resist a dropping of up to 2 meters. 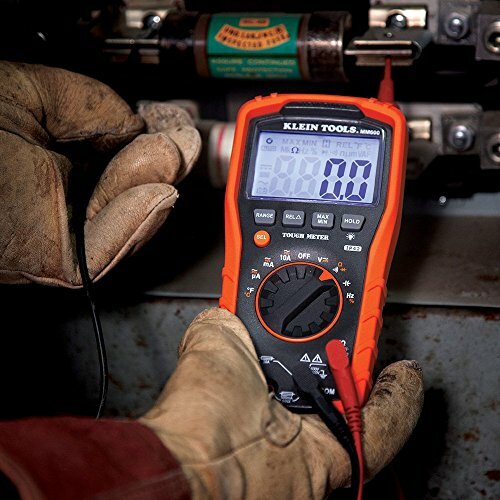 The multimeter is powered by 2 x AAA batteries and meets CAT IV 600V safety rating. Also, it has an auto-ranging feature and battery level indicator for alerting the user when the battery is low. Klein mm600 performs various tests such as volts, resistance, capacitance, current, temperature, and many others as you will learn in this Klein mm600 review post. Using the wrong multimeter might bring havoc to you or damage the device. 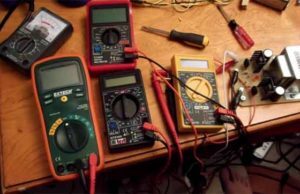 Before you acquire any digital multimeter, you have to know what it can do and can’t do. This will help you in getting a tool that can handle the tasks that you have. It can be to measure volts, ohms, or resistance. Some cannot measure temperature, while others perform lots of functions. Ensure that you pick a quality device that won’t break the next day. 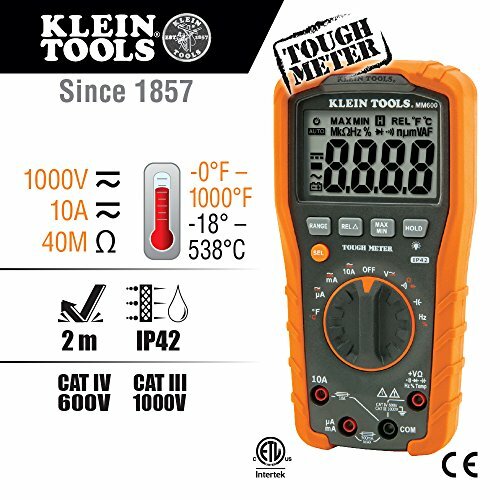 Related: klein mm400 multimeter buying guide. 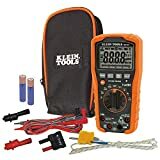 Why buy Klein mm600 digital multimeter? It is built with a hard plastic material that will withstand the hardships that it faces in the field. Since electricians and engineers work in tough conditions, this multimeter will still deliver despite experiencing wear and tear. This is because the material it is constructed with can resist an impact of up to 2 meters. The multimeter has very easy to use features. The buttons and ports on the device are well labeled. Also, it has a large LCD screen with backlight which enables the user to easily read outcomes in the dark or light quickly. All you have to do is to place the test leads in their right ports when taking different tests or during troubleshooting. This versatile digital multimeter is suitable for use at home, business, and light-industry. This is because it has the ability to carry out a wide range of tests and measurements such as voltage, current, resistance, temperature, continuity, frequency, test diodes, capacitance, and duty cycles. For a person to use the multimeter for long, they need to take good care of it. The Klein mm600 digital multimeter comes with a storage case that makes keeping it be easy and safe. When you finish carrying out tests, you can place the device back in the case. This will prolong its life as its safe. Furthermore, its small size allows the user to keep it in the backpack as they travel from one area to another. The Klein mm600 digital multimeter has a battery level indicator that lets the user know the remaining power of the battery. The multimeter uses 2 x AAA batteries. It also has an easily accessible battery and fuse replacement compartment. I should mention in this Klein mm600 review that I love this features. Besides providing accurate and fast readings, this device is compactly designed and very easy to handle. It is comfortable in the hands and lightweight, too. You can use it for hours without feeling burdened. Its sleek design means that you can feel free to remove it anywhere and you will have your colleagues admiring it. Klein is a reliable brand with lots of amazing multimeters to offer to clients. They concentrate on creating durable and accurate digital multimeter devices. The Klein mm600 is just one of their various products on offer. At such a great price, you will get several features that the Klein mm600 dmm offers. It has similar functions to high-end multimeters. So, the user stands to benefit from this quality device for many years to come. This multimeter is very slow compared to other multimeters in its price range. Not good if you want to carry out various tests. If you have lots of tests to conduct, then look away. But if you want a multimeter for simple domestic tests and troubleshooting, then this is a great fit for you. The Klein mm600 digital multimeter is sturdily built and can resist an impact of up to 2 meters. It comes with a large display screen that displays readings even in the dark as it has a backlight. The device is compact and easy to handle. With its battery level indicator, you will know when the batteries are running out and replace them. The Klein mm600 will help you test volts, ohms, resistance, capacitance, temperature, frequency, test diodes, continuity, and frequency. 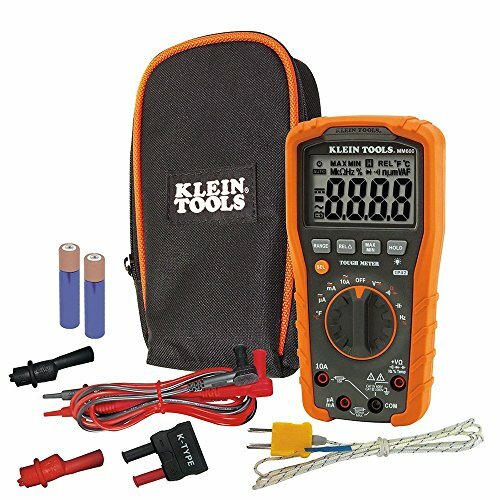 5 Why buy Klein mm600 digital multimeter?